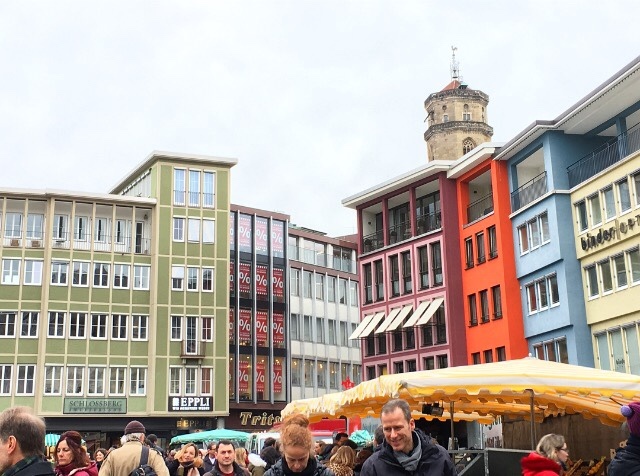 If you read my previous post about Airbnb, you'll know that this weekend I went to Stuttgart for a little weekend away with three other assistants. This was actually my first trip outside Bayern in Germany, even though Stuttgart (which is in Baden-Württemberg) is actually only two hours away from Nuremberg by train. It was a city I didn't really know much about to be honest. 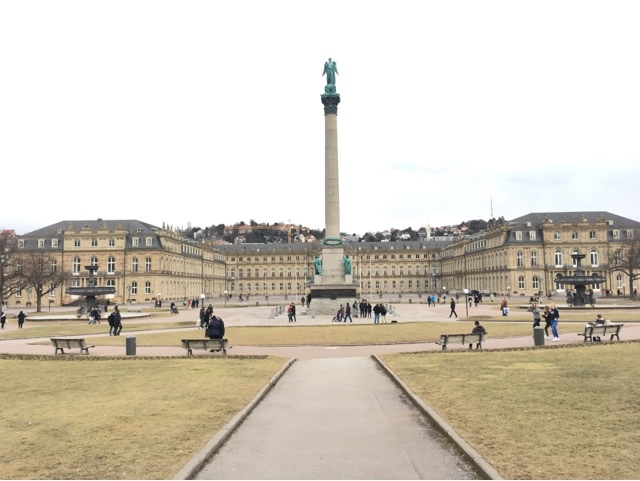 I had seen countless pictures in front of the neues Schloss and thought it seemed like a pretty cool place to visit. 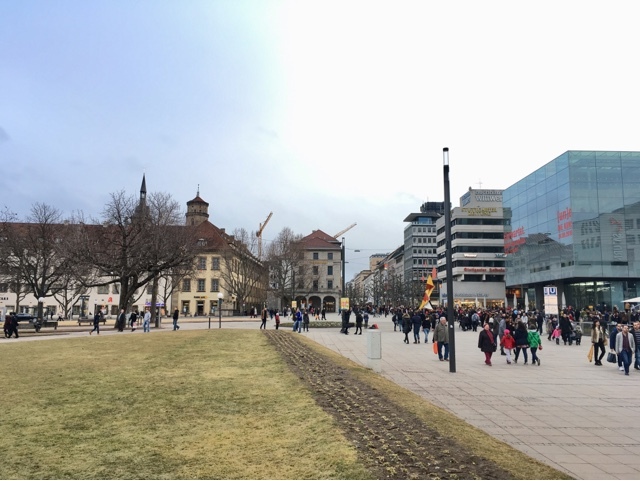 As the birthplace of both Mercedes and Porsche, Stuttgart is stereotypically known as a rather rich city and with signs of a lot of construction work when we were there, it is quite unlike most I have visited so far. Without the same initial charm as my beautiful Nuremberg, or the smaller little Bavarian cities such as Bamberg or even Bayreuth we were curious to find the heart of the city so whilst we were there, so didn't actually visit any of the major museums in the city such as the Mercedes Benz museum or the Landmuseum. However we did have a good long walk around many of it's most well known points and areas. I thought in todays blog post I would go through some of the areas and points of interest we visited so you can get a feel for the city too. Schiller Platz is a small square pretty much right in the very centre of the city. When we were there (a Saturday) there was also a small market which made the square pretty busy and a little hive of activity. 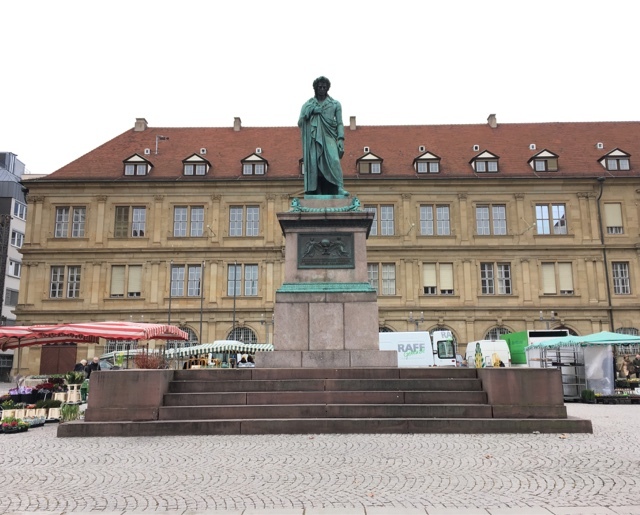 There are lots of museums and interesting architecture all round the side of the square and a statue in memory of Schiller right in the middle. For lunch we went to the Markthalle, housing a great variety of regional and national stands all selling fresh produce and offering samples of many things. 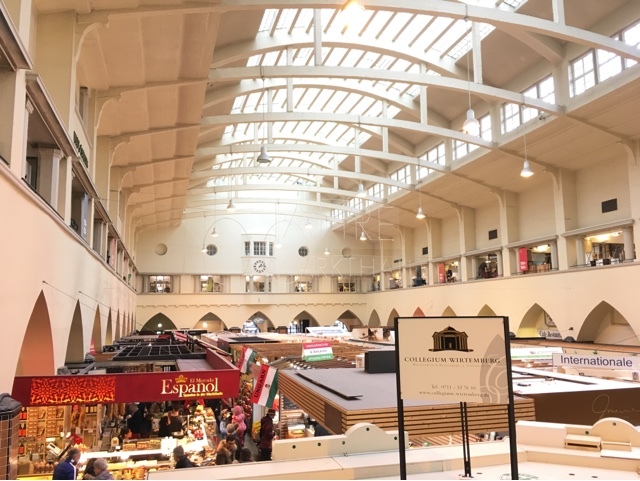 This was great for us as we all tried different things and I can seriously recommend the stall right up in the farthest back corner that sells falafel and hummus. I would maybe go as far to say it is the best I have ever had. Big fan. Above the stalls there is a floor with all sorts of small designer alcoves selling a whole variety of things, although mainly homewear and beauty. Post falafel, we decided to head out towards an internet recommendation and check out the Bohnenviertel. Translating literally as the bean quarter, it was only about ten or fifteen minutes walk from the main hustle and bustle yet it felt miles away. Consisting of a few small and windy streets, it was a perfect way to see another side of the city. With antique shops and "hipster" cafes galore it is a lovely little spot to have a walk and grab a coffee. 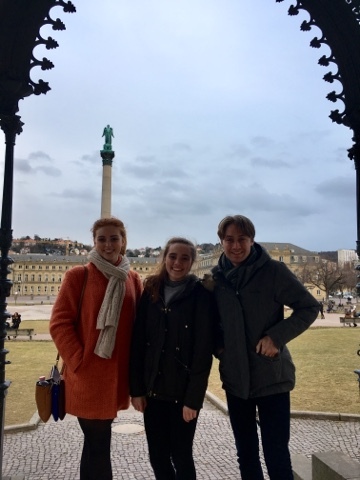 After a Cappuccino and potentially the most moist chocolate and cherry cake of my life, we walked back towards the main square, Schloßplatz to get that all important Instagram in front of the castle. With the hum of a city accompanied with the buzz of musicians busking in the street, there was a great atmosphere. The pictures will never really do the buildings justice and it was lovely to see some grass and a big area to just chill in, something which I really think Nürnberg lacks. 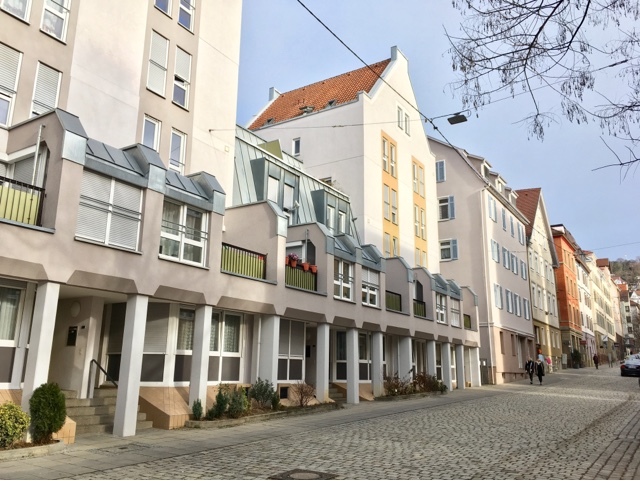 Leading off Schloßplatz, you will find yourself back on the main shopping streets on your way to the train station. 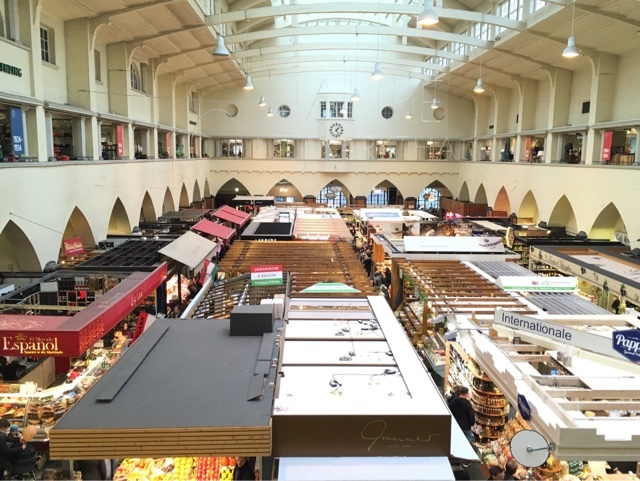 With all the shops you would typically expect in a German city, if you are there to do some shopping I do not think you would be disappointed. However we decided to zip past all the shops and head straight for the Hauptbahnhof to try and climb the Bahnhofsturm before sunset. 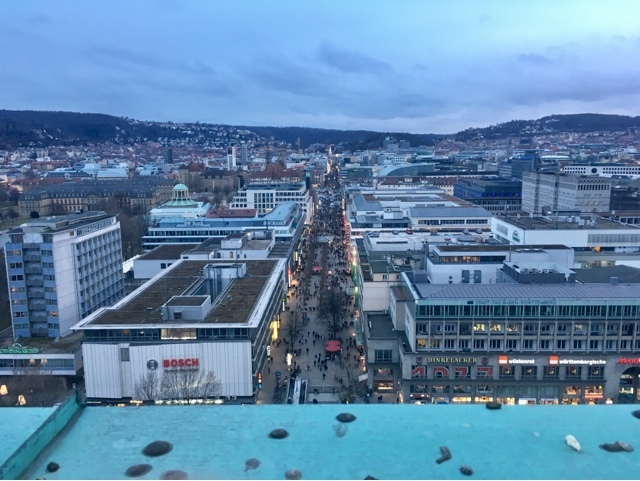 As you can see from the picture below, Stuttgart doesn't exactly have the most impressive skyline, however it was nice to see the city from a different angle. Even if I did get a bit vertigo-y at the top and headed down pretty promptly. Is there anything we missed? Any must see spots in the city that you would recommend? With Volksfest season coming up and different beer festivals every weekend it is a strong possibility we will be back! So let me know in the comments if there is anything we simply can't miss the next time! I love Germany. 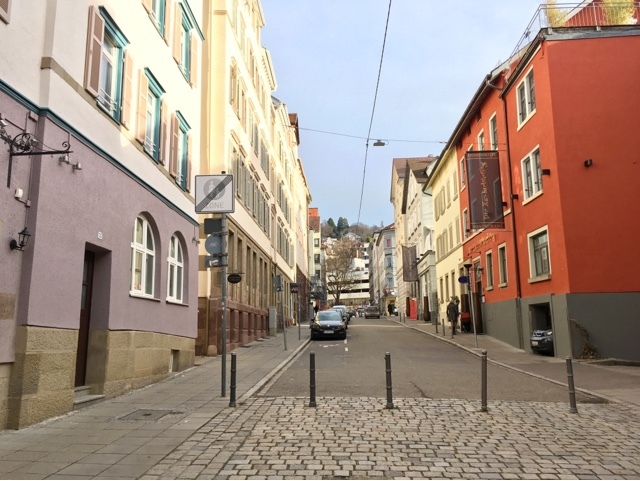 I'm moving to Germany at the end of this month, and I can't wait to explore more small towns.